The SH 56 C-E shredder vac turns yard work into less work. The fuel-efficient STIHL gasoline-powered engine really brings the power to the specially designed blade on the fan wheel – cutting yard waste down to size. Better yet, this versatile STIHL tool offers one power tool that does the work of two. It comes standard with the necessary parts to easily convert the shredder vac into a handheld blower. And as it shreds, the clippings accumulate in a secure, easy-open zippered bag for convenient emptying. And with the STIHL Easy2Start™ system, starting is easy – almost effortless. STIHL EASY2START™: The STIHL Easy2Start™ system makes starting STIHL® outdoor power tools almost effortless, eliminating the need for a strong pull of the starting cord. 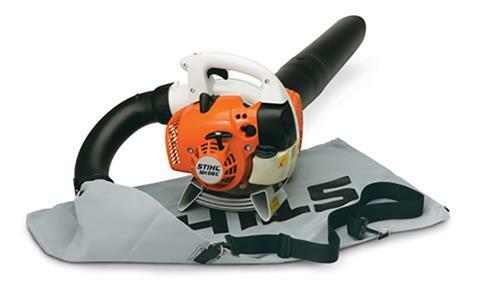 This advanced starting system is designed to make starting STIHL® products fast and easy. The specific system may vary by model, but in each case, a quick pull overcomes the engine’s compression to minimize the strength and effort required to start. Available on selected products. SHOULDER STRAP: The STIHL shoulder strap allows for greater maneuverability and helps reduce operator fatigue, allowing the user to work comfortably. PURGE PUMP PRIMER: Lets you prime the carburetor without flooding it. PROTECTED SPARK ARRESTOR MUFFLER: Has large baffles which reduce sound level and contains a screen designed to reduce the emission of sparks.